You will find on these pages the celebrity horoscopes having the 6th House in the 12 signs with an interactive chart and excerpts of astrological portrait. The 6th house: everyday life, daily work and colleagues, lower-ranking co-workers, and health. It describes the native's everyday life, his behaviour at work, minor obligations, servitudes, lower-ranking co-workers, and pets. It also concerns health, medicines and minor illnesses. 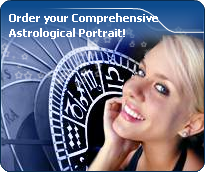 The sixth astrological house is in analogy to the sixth sign of the zodiac, Virgo.